Godzilla’s Gareth Edwards Will Direct the First Star Wars Spin-Off Film! We knew we’d start hearing about the spin-off’s, but Lucasfilm dropped a bomb when they announced that red-hot director Gareth Edwards will be helming the first ever non-episodic Star Wars film. Edwards, whose Godzilla opened huge last week, will be returning to do a sequel to the blockbuster, but not before traveling to the realm of Star Wars to tackle a yet-to-be announced standalone film. The film will be released on December 16, 2016, so it looks like these are going to be Christmas releases, which I love. I love that every year for Christmas I’m going to get a new Star Wars film. I also tend to think that this is NOT the Boba Fett film. Lawrence Kasdan has been writing that script and they pointedly announced another screenwriter. This would negate the Hasbro Leak that we’ve been mulling over this week. If I had to guess, I’d say Han Solo or Yoda; most likely Han. They might even get Ford to do flashbacks if necessary if they do that one first so that’s my bet. I’m excited that Disney is going out and getting young, pumped film makers instead of just recycling names. Edwards sounds like he’s walking on clouds. Abrams has been super enthusiastic with Episode VII and you need that kind of passion. Find the directors who grew up idolizing these films and give them a chance to play in the sandbox. I’m very intrigued by the choice and I’m so pumped that all this Star Wars is coming up SO SOON! In addition to the episodes of a new “Star Wars” trilogy, Lucasfilm and Disney have begun development on multiple stand-alone movies that will offer new stories beyond the core Saga. Gareth Edwards will direct the first stand-alone film, with a screenplay by Gary Whitta. The film is due out December 16, 2016. 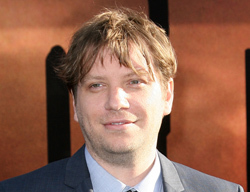 Gareth Edwards blazed into the filmmaking forefront with his acclaimed work on “Monsters,” a film he wrote, directed and served on as cinematographer and visual effects artist. The skill and vision readily apparent in “Monsters” earned him the high-profile spot directing this year’s smash hit “Godzilla”. Gary Whitta’s screenwriting credits include 2010s “The Book of Eli” starring Denzel Washington. He is also well known as a journalist and editor in the video game industry, as well as part of the BAFTA award-winning team on Telltale Games adaptation of “The Walking Dead”. Star Wars: Episode VII, meanwhile, is set to star John Boyega, Daisy Ridley, Adam Driver, Oscar Isaac, Andy Serkis, Domhnall Gleeson, and Max von Sydow in addition to original cast members Harrison Ford, Carrie Fisher, Mark Hamill, Anthony Daniels, Peter Mayhew, and Kenny Baker. It will open in wide release on December 18, 2015. Hope it’s not Han. Episode 7 will be Han-centric. If the spinoff movie is about him too, that could spell early SW audience burnout. They need to vary the content and tone when they make these movies. Well in his comments he said he’s ready to join the Rebel Alliance so that makes me think it’s a good guy. I know it’s not Fett because Kasdan isn’t involved. Could be Red 5/Rogue Squadron. Could be Yoda. My gut says Han, but I didn’t see Gareth Edwards getting picked this week lol. I knew we were going to see movement though. I wouldn’t be surprised if the Episode VIII director is picked and set this year as well as spin-off #2 (which I think WILL be Fett). It’d be great to see Brad Bird doing one of those. If Cuaron does Harry Potter again, he’s out for this round. Those are my two top choices. Bird was my first choice to direct Episode 7. Hadn’t considered Cuaron, but yes. Verbinski would have been perfect for one of the spinoff films, were it not for… do I actually have to say it? Perhaps he’ll get his cred back, and one day it will happen. I can dream. It’s good they’re not starting with Boba Fett. The nerds would go crazy, but having a villain for a protagonist would be off-putting for just about everyone else. Let Boba wait until the Disney/Lucasfilm thing has been established. I want to see Yoda in a spinoff, but I want him done correctly, I want an epic spanning his entire 900-year life. Come on, Disney, I know you have the money. The screenwriter indicates to me this is not Solo, Yoda or Fett because those are the three batted about for a year and there are two other screenwriters working on those. Yoda I’ve heard they want to keep doing the LEGO shorts with for awhile before they unveil his epic. SO….Rogue Squadron? Edwards specializes in creature work. Chewie? I am thrown by matching this with a project, but I like Edwards in the mix. Verbinski is done. He’s not coming back. Bird IS doing one of these; just a matter of time.